We've got the most interesting birdbaths in town, providing our birds with a place to drink and bathe in luxury. Our birdbaths offer a strong focal point for your garden, attract beautiful birds, and create a natural soothing environment. When a stone carved birdbath is integrated with the plants in a garden, it will be strikingly beautiful and functional. From a small simple birdbath all the way up to large and elaborate ones, Ferree Studios can carve them all. Our birdbaths are original and we design new ones every season. Choose a birdbath design to grace your garden and bring birds flocking to your special place. Contact us today for a custom stone carved birdbath. Our birdbaths are hand hewn from natural stone. 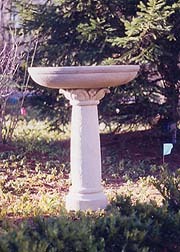 Indiana limestone is the most popular material used to create a stone birdbath. Our birdbaths are also available with plumbing to enhance your garden or patio. Click on the birdbath image for an enlarged view. Images will open a new window, please disable popup blockers to see a larger view of our birdbaths. Please check our birdbaths currently for sale ! 570 942-0322 Fax West Coast Sales Rep. Artist Copyright - All works of art within this web site are protected under U.S. copyright laws and international conventions. No portion of the artists works may be used, downloaded, reproduced using any means, copied, or transferred electronically, without written permission from the individual artist.